To be honest, I’ve never been a huge fan of squash. All that changed, though, when I tried acorn squash for the first time. I love that it’s so easy to make: just cut in half, scoop out the seeds, place cut sides down on a cookie sheet to bake in the oven. I’ve even tried making acorn squash in the microwave, and it turned out great, though it didn’t have the roasted flavor that it gets when cooking in the oven. Looking for some other sweet treats? We love this cream cheese caramel apple dip, and this sweet cake batter dip with cream cheese and cake mix. 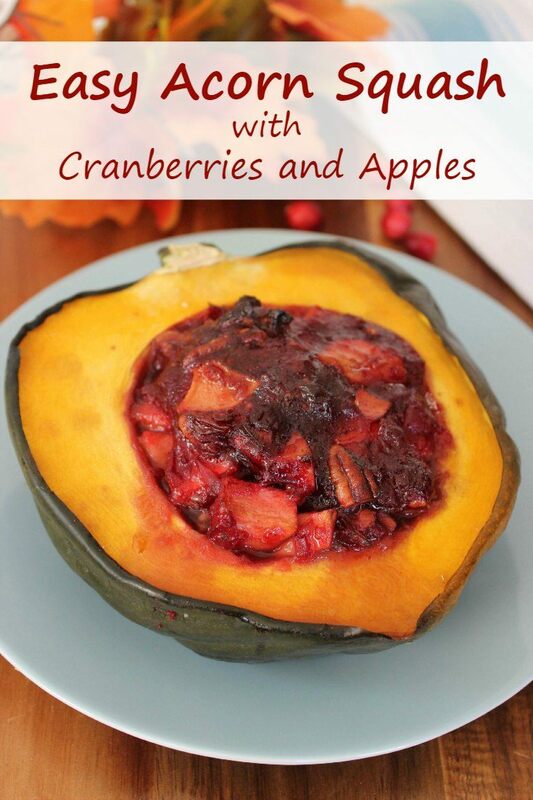 This easy acorn squash with apples and cranberries recipe is simple and easy to make but it looks beautiful. It’s a perfect recipe to serve for a nicer dinner, because it looks so good, but doesn’t take hours in the kitchen to make. First, bake the acorn squash. Core, peel, and chop apples. Lightly grease a shallow baking dish and place squash cut side down in pan. Now, you’re ready to make the cranberry apple filling. Add cranberries, water, cinnamon, brown sugar and nutmeg to a medium pan over low heat. Cover and cook until cranberries begin to pop and get soft. Mix cornstarch with 1 tablespoon warm water and add to cranberry mixture and stir until thickened. Add apples and pecans and stir. Now, you’re ready to stuff the cranberry apple filling into the acorn squash. Remove the acorn squash from the oven. Return squash to pan, with the cut side up. Fill with the apple cranberry mixture and bake another 30 minutes.